Full disclosure: It won't work unless you've ordered a drink. The hack only works with foods that come in a box. Buckle up, people. There are some real outside-the-box thinkers on the loose. 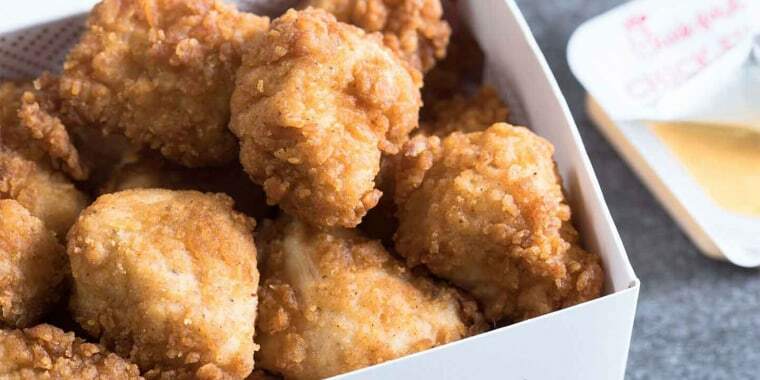 Chick-fil-A may not have the speediest drive-thru in the land but now, thanks to a peculiar hack, fans may be able to enjoy their nuggets faster than ever before. Tweeters obsessed with America's favorite fast food restaurant have recently discovered that the mysterious hole in the chicken nugget box can be used to expedite eating while driving, making munching on the road more convenient and less messy. One of the first people to share the hack on Nov. 11 sparked a chicken nugget feeding frenzy across social media, leaving many in America eternally grateful. While it's best to refrain from eating while driving altogether (keep those eyes on the road, not on food! ), for those who do, this hack just changed their nugget struggle for life. I feel like if I would’ve known this driving to florida, I could’ve been a way better driver , ya feel??? Many tweeters were floored by the creativity. Others praised it as a pure stroke of genius. Much to the chagrin of many excited tweeters, one person speculated that the containers' holes weren't actually meant for straws at all. And that tweeter was right. A Chick-fil-A spokesperson confirmed to TODAY Food that the little tabs actually exist so restaurant team members can identify what's in the box. Similar to how many disposable soda lids have bubbles to pop in for "diet" or "other" drinks, Chick-fil-A has tabs to poke open and the back of each box is marked with "nuggets," "strips" or "other." The spokesperson also added that the chicken chain "is not recommending customers put the straw through the hole — that’s just not what it’s intended for." So, straw-boxers, use this hack at your own potential peril. Did that just crush your dreams? Same. But don't lose hope just yet. While this hack may have seemed like a revolution,other innovators have been coming with ways to keep their fast food meals save in moving vehicles. For example, some people use the car door as a fry holder. So, even if Chick-fil-A soon axes plastic straws like Starbucks, there are endless possibilities to eat, drink (your soda!) and drive.